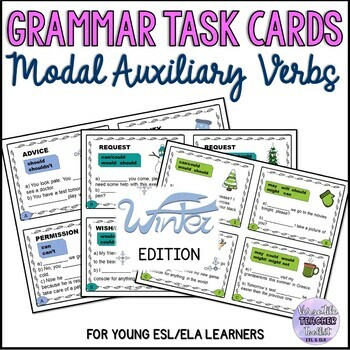 Modal auxiliary verbs task cards for ESL/ELA learners. 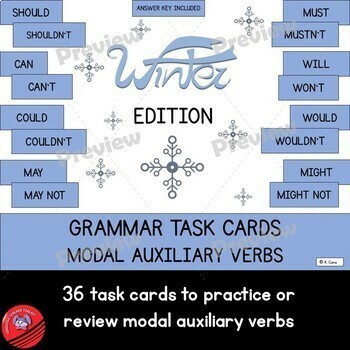 In this document, you will find 36 task cards (+36 answer key task cards) that help students practice or review modal auxiliary verbs. Answer key and Answer log included. 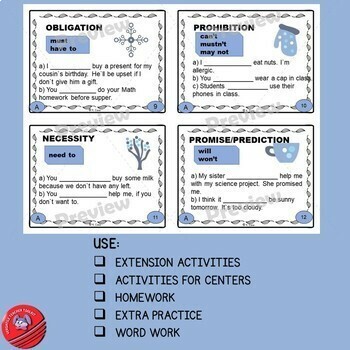 There are three sets of task cards and 3 Answer logs for each set in a PDF file. Each set is followed by the answer key. Set A and set B contain different exercises. Set B and C contain the same exercises but set C does not indicate the type of modal auxiliary on the top of the page (modal auxiliary showing obligation, advice, permission, etc.). So, students have to choose the right modal without any guidance. You can laminate the task cards and reuse them for many years to come. Students can write their answers on the cards and erase them when they finished the activity. The cards can be used to check students` understanding of modal auxiliary verbs at the end of the lesson or you might use them to let your students practice these auxiliaries individually or in small teams. This resource could be used in upper elementary school and high school, however, please check out the preview to make sure it is appropriate for your students. Please note that past modal auxiliary verbs are not included in this set of task cards. Before downloading a product, read the product description and check out the preview document to determine if the resource is appropriate to your needs. If you still have questions, do not hesitate to contact me. I will be glad to answer your questions. Don't forget that leaving feedback earns you points that you can use on future TpT purchases. I would highly appreciate your rating! Also, follow me to be the first to know about new resources, freebies and sales! All rights reserved to K. Cana (Versatile Teacher Toolkit store). This resource may be used for personal and educational print purposes only. This document may not be shared with others, modified or posted on websites, blogs or sold as your own creation. You may make copies for your own personal or your own classroom use only. Feel free to make as many copies as you need for your own personal use or students.